Born in Botoșani, Roumania, he attended yeshiva in Sighetu Marmației. In 1905 he came to Czernowitz and there took up his general (secular) education, studying at the university. In 1909 he left for Paris where he studied in the Sorbonne and became a resident of Paris. He published his first piece in 1913 in Fraye arbeter shtime (Free voice of labor), an article concerning the Provençal writer Frédéric Mistral. He wrote for Yiddish-language newspapers and periodicals in Europe and the United States: literary-critical articles, correspondence pieces concerning Jewish life in France, and translations from Dutch, German, and mainly French. He translated in Yiddish the plays: Der karger (Le Misanthrope[?]) by Molière; and Di shpil fun lebn un toyt (Le Jeu de l’amour et de la mort) and Di velf (Les Loups), both by Romain Rolland; the Yiddish Art Theater in New York staged Di velf in 1924 in Blumenfeld’s translation. He was a pioneer in popularizing modern Yiddish literature for readers of French. In a series of important French periodicals, he published translations of Yiddish writers as well as critical essays, among them: Sholem Asch, Dovid Bergelson, A. M. Vaysenberg, Y. Rozenfeld, A. Reyzen, and Y. Opatoshu. 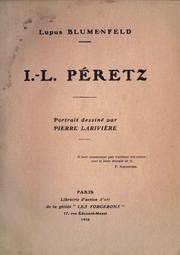 Among his books (in French): I.-L. Péretz (Paris, 1916); a collection of stories by Sholem Asch and Anthologie des conteurs yidisch (Paris, 1922). Blumenfeld’s translation of Dovid Pinski’s Der oyster (The treasure) was staged in Paris at the avant-garde Théâtre de l’Atelier of Charles Dullin. He also wrote a large number of original pieces in French, among them a novel about Jewish life in France. He died in Paris. Sources: Zalmen Reyzen, Leksikon, vol. 1; Z. Zilbertsvayg, Teater-leksikon, vol. 1; Algemeyne entsiklopedye (General encyclopedia), vol. 5 (New York, 1944); S. Wininger, Grosse jüdische National-Biographie (Czernowitz, 1929), vol. 1; Dr. B. Tsapur, in Literarishe bleter (December 27, 1929).